Shredded Jackfruit has a mild taste and texture similar to meat. This jackfruit is native to southern India, where prolific trees flourish on family farms that are certified organic to USDA standards. These jackfruit shreds are sealed in packaging without brine, which allows them to absorb more flavors while cooking. Jackfruit is an excellent vegan/vegetarian, soy free, gluten free, and kosher alternative to meat. This fleshy fruit has a mild flavor and meaty texture remarkably similar to shredded chicken, pork, or beef. Each 7 oz. 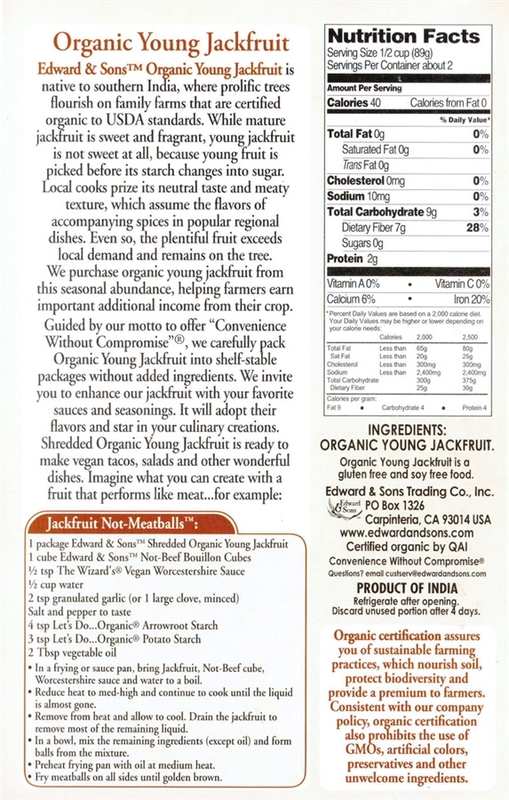 package contains about 2 servings of Shredded Organic Young Jackfruit. I was a little unsure of the strong fruit smell -yes, I do know it’s fruit, I just wasn’t really expecting the prune-y smell. After preparing it though, the smell pretty much went away and it was pretty good. for some reason this version had no odd taste as the pieces one. I love this. Made vegan chili and added this to it. I am planning to buy more.